Readers will delight to journey along with nine hearty souls from around the globe who seek a new and better life in a country founded on second chances. Each of the nine historical romances will renew faith in the American dream, pure romance, and faith-based marriages. 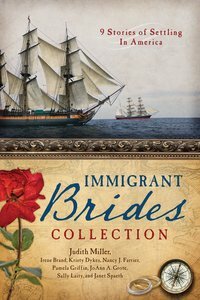 About "9in1: The Immigrant Brides Collection"
Irene Brand's goal of being a writer was conceived at an early age in her rural home in West Virginia. In the early 70's she started publishing in historical, religious, and general magazines. During that time she also edited and compiled two church histories. She has written Sunday School curriculum, edited a two-year series of mission curriculum, and her works have appeared in five program-material anthologies. Her publishers include Zondervan, Standard Publishing, Thomas Nelson Publishers, Fleming-Revell, Barbour Publishing, Kregel Publications, and Steeple Hill (inspirational imprint of Silhouette). She has had 3 non-fiction books published, and 17 fiction works including the Love Inspired and Heartsong series, Test of Love was released in Poland in 2003. Kristy Dykes and her husband live in Jacksonville, Florida, and often travel to hold marriage seminars on "loving your mate." Pamela Griffin lives in Texas and divides her time between family, church activities, and writing. Nancy J. Farrier is the author of eight books and two novellas, as well as numerous articles and short stories. She and her family reside in Arizona. Griffin divides her time between family, church activities, and writing. She fully gave her life to the Lord Jesus Christ in 1988, after a rebellious young adulthood. JoAnn A. Grote is an accountant from Minnesota. Judith Miller is an award-winning author whose avid research and love for history are reflected in her novels, two of which have placed in the CBA top ten lists. In addition to her writing, Judy is a certified legal assistant. Judy and her husband make their home in Topeka, Kansas. When Janet Spaeth isn't writing, she's reading or spending precious hours with her family in North Dakota.